What else will Tesla give you? Free Wi-Fi of course. I spend a lot of time at Tesla facilities… Whether it’s a supercharger, a Tesla Store, or Tesla Service, I tend to like to be at Tesla facilities. Yes, I’m obsessed. Either way, what else do you get for free at Tesla, well, their guest Wi-Fi is free and the password is the super secure “abcd123456”. So, if you find yourself supercharging at Hawthorne, CA or at a Tesla Service Center, just remember to connect to the “Tesla Guest” or “Tesla Motors Guest” network and use that super-secure password. Now, remember, it’s a shared wi-fi network, so be warned, be careful, and be safe. Use some sort of protection when connecting. 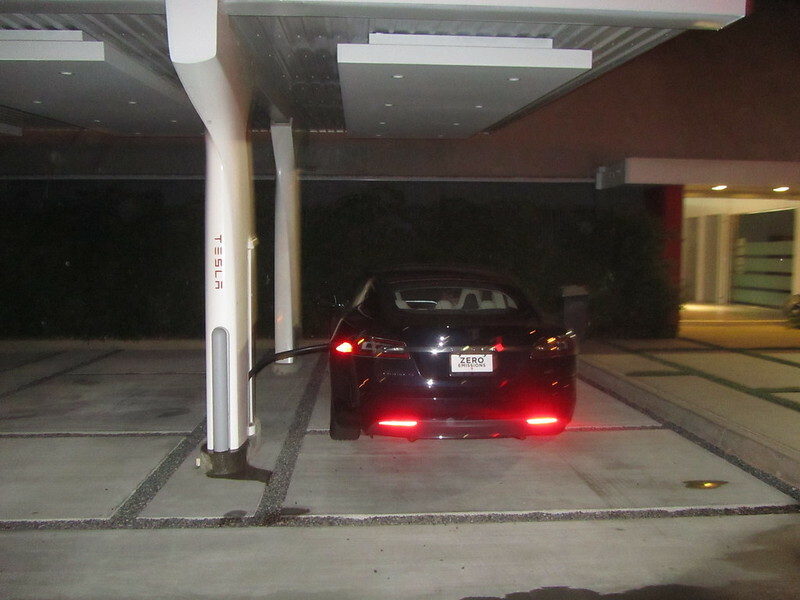 Here’s my Model S at a late night stop on the way home from Hawthorne on our first Tesla Weekend… using the free wi-fi at Hawthorne Design Center/Supercharger. We prefer the term “enthusiasts”.